This pessimism is especially prevalent among immigrants, who account for 54% of all Hispanic adults in the United States. Fully 63% of these Latino immigrants say that the situation of Latinos has worsened over the past year. In 2007, just 42% of all adult Hispanic immigrants—and just 33% of all Hispanic adults—said the same thing. These increasingly downbeat assessments come at a time when the Hispanic community in this country—numbering approximately 46 million, or 15.4% of the total U.S. civilian non-institutional population—has been hit hard by rising unemployment (Kochhar 2008) and stepped-up immigration enforcement. In the survey, nearly one-in-ten Hispanic adults—native-born U.S. citizens (8%) and immigrants (10%) alike—report that in the past year the police or other authorities have stopped them and asked them about their immigration status. Some Latinos are experiencing other difficulties because of their ethnicity. One-in-seven (15%) say that they have had trouble in the past year finding or keeping a job because they are Latino. One-in-ten (10%) report the same about finding or keeping housing. On the question of immigration enforcement, Latinos disapprove of all five enforcement measures asked about in this survey—and generally do so by lopsided margins. Most Latinos (63%) say that there has been an increase in the past year in immigration enforcement actions targeted at undocumented immigrants. And, in response to an open-ended question, a plurality (30%) of those who say there has been such an increase cite anti-immigrant sentiment as the biggest cause. Smaller shares cite government or policy-related measures (21%), security-related concerns (11%) or motivations related to the economy (9%). The survey finds that a majority of Latinos worry about deportation. Some 40% say they worry a lot and an additional 17% say they worry some that they themselves, a family member or a close friend may be deported. This is up slightly from 2007, when 53% of Latino adults said that they worried a lot or some about deportation (Pew Hispanic Center 2007). Not surprisingly, worries about deportation and perceptions of discrimination in jobs or housing because of Hispanic ethnicity correlate with the view that Latinos’ situation has worsened in the past year. Two-thirds (68%) of Latinos who worry a lot that they or someone close to them may be deported say that Latinos’ situation in the country today is worse than it was a year ago, as do 63% of Latinos who have experienced job difficulties because of their ethnicity and 71% of Latinos who report housing difficulties because of their ethnicity. Hispanics are an important voting group in the November 4th election, and their widespread pessimism about the situation of Latinos as well as their strong opposition to federal enforcement policies could well have consequences in the political arena. About half (49%) of all Latinos say that the Democratic Party has more concern for Hispanics, while just 7% say the Republican Party has more concern. 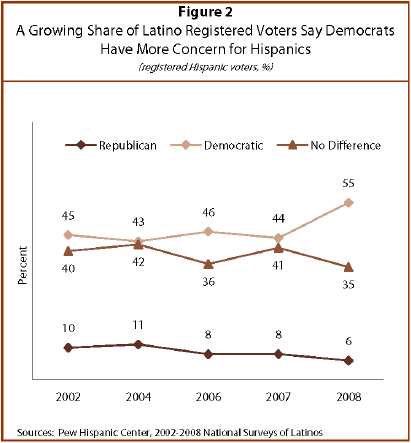 Since 2004, the share of Hispanics who say that the Democratic Party has more concern for Hispanics has increased by 14 percentage points. Most of this gain for the Democrats comes from a reduction in the share of Latinos who say there is no difference between the parties. Among Hispanics who are registered voters, a majority say that Democratic presidential nominee Barack Obama is the better candidate for Hispanics (55%) and for immigrants (50%). Just 11% of Hispanic registered voters say that Republican presidential nominee John McCain is better for Hispanics, and just 12% say he is better for immigrants. The remainder see no difference between the two candidates on this front. Overall, Hispanic registered voters support Obama over McCain by 66% to 23% (Lopez and Minushkin 2008). This report is based on a bilingual telephone survey of a nationally representative sample of 2,015 Hispanics ages 18 and older. Interviews were conducted from June 9 to July 13, 2008. The margin of error of the survey is plus or minus 2.8 percentage points at the 95% confidence level. For a full description of the survey methodology, see Appendix 1. 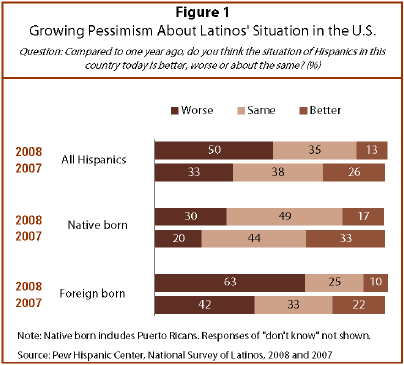 The 2008 National Survey of Latinos focuses on Hispanic adults’ views of immigration enforcement and perceptions of discrimination. The report also explores how Latinos rate the political parties and their presidential candidates on immigration and Hispanic concerns. The survey was conducted from June 9 through July 13, 2008, among a randomly selected, nationally representative sample of 2,015 Hispanic adults, 892 of whom report that they are U.S. citizens and registered to vote. The survey was conducted in both English and Spanish. The margin of error for the full sample is plus or minus 2.8 percentage points; for registered voters, the margin of error is 4.4 percentage points.